Comprehensive open-source Java persistence solution addressing relational, XML, and database web services. Provides standards based Object-Relational persistence solution with additional support for many advanced features. EclipseLink JPA provides advanced support for leading relational databases and Java containers. Enables Java developers to efficiently bind Java classes to XML Schemas. MOXy implements JAXB allowing developers to provide their mapping information through annotations as well as providing support for storing the mappings in XML format. The many advanced mappings enable developers to handle the complex XML structures without having to mirror the schema in their Java class model. Declarative Web Service solution for accessing relational databases. The DBWS Builder generates the necessary configuration files based on the provided database artifacts so that EclipseLink's relational and persistence services can be combined to handle the requests. The EclipseLink JPA provides developers with a standards based Object-Relational persistence solution with additional support for many advanced features. EclipseLink JPA provides advanced support for leading relational databases and Java containers. Basic examples of configuration necessary when using EclipseLink JPA. Using EclipseLink JPA in a JSF application. This tutorial illustrates the use of EclipseLink JPA in a JSF application. The tutorial includes configuration and usage information in leading Java EE containers. Using EclipseLink JPA in an RCP Application. This example provides a simple RCP application that uses EclipseLink JPA. It illustrates the usage of EclipseLink JPA in an Equinox environment. This example is a variation of the NoSQL Example with some of the entities mapped to MongoDB and some to relational database. The EclipseLink MOXy component enables Java developers to efficiently bind Java classes to XML or JSON. MOXy implements JAXB as well as SDO standards allowing developers to provide their mapping information through annotations as well as providing support for storing the mappings in XML format. The many advanced mappings enable developers to handle the complex XML structures without having to mirror the schema in their Java class model. This examnple walks through the configuration and usage of MOXY's JAXB implementation. This tutorial illustrates for a POJO object model can be mapped to an XML schema using the EclipseLink Workbench and XML mappings with the JAXB runtime API. 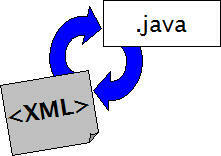 JCP page for Java API for XML Binding specification. Generating a static SDO DataObject model from an XML schema using EclipseLink's SDO compiler. EclipseLink SDO provides Data Access Service (DAS) combining existing POJO object models or JPA entities wrapped within static or dynamic data objects. The EclipseLink DBWS component enables Java developers a declarative Web Service solution for accessing relational databases. The DBWS Builder generates the necessary configuration files based on the provided database artifacts so that EclipseLink's relational and persistence services can be combined to handle the requests. The student example is intended to provide a simple example of using JPA-RS with a single entity persistence unit in a web application. Dmitry Kornilov's blog describing slightly more advanced JPA-RS features. Detailed design documentation for EclipseLink 2.7 JPA-RS features. Brief walk through of the DBWS configuration files and usage with the DBWSBuilder utility. Basic example illustrating how a table can easily be exposed as a web service using default CRUD operations. The minimum requirement to run EclipseLink 2.7.x is Java 8. Please ensure that you have Java 8 installed and it's working. The EclipseLink Project's produced contents are dual-licensed under the terms of the Eclipse Public License v1.0 and Eclipse Distribution License v1.0. For the license of dependent libraries included within a distribution please refer to the about.html file within each distribution. We provide support to our community using the Eclipse Forums. It's a place to ask questions, reach out to committers and/or share your experiences with other members of the community.